Frank Grzeszczak at International Yacht Collection tells me he and his son Frank Jr have closed on their listing for sale, the 24.4m motor yacht Emuna, with Andrey Shestakov at Atlantic Yacht & Ship representing the buyer. Emuna was built by the Italian yard Ferretti in composite to a design by Studio Zuccon as a Ferretti 800 model and delivered in 2013. Accommodation is for eight guests in four staterooms laid out as a large master suite with light pouring in from oversized windows, a VIP stateroom and two twin cabins, all with en suite bathroom facilities. The large flybridge includes a second helm, sunbathing area and a very large table with seating, ideal for al fresco entertaining and dining. Further features include the bow area incorporating a generous sunbathing area and seating while the garage at the stern, below the large cockpit, opens to provide a large swim platform. 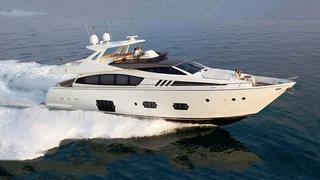 Twin 2,450hp MTU engines give her a cruising speed of 27 knots and Emuna was asking $4,995,000.